A pleural effusion refers to the abnormal accumulation of fluid in the chest cavity. and it can cause shortness of breath. It can be one cause of shortness of breath, which is a symptom that can severely affect your quality of life when dealing with mesothelioma. Pleural effusions are a very common sign of pleural mesothelioma. Dr. Snehal Smart of Asbestos.com explains how pleural effusions can lead to a mesothelioma diagnosis. A small amount of fluid normally fills the pleural cavity to help the lungs glide smoothly in the chest as we breathe in and out. When mesothelioma or another condition causes pleural effusion, excess fluid fills the pleural cavity and can make breathing more difficult by compressing the lung and limiting its ability to move freely. On their own, uncomplicated pleural effusions are not life threatening and will sometimes resolve completely after 3 or 4 months. However, they often recur periodically. They commonly arise before an asbestos-related disease called pleural thickening and contribute toward its progression. Pleural thickening, characterized by the accumulation of fibrotic scar tissue on the pleura, can increase after each episode of effusion. If you don’t seek immediate treatment, pleural fluid may become infected and cause a condition called empyema. Excess pleural fluid can also cause a lung to collapse. Pleural effusions can develop for many reasons, but they commonly accompany asbestos-related illnesses such as mesothelioma, lung cancer and asbestosis. After exposure to asbestos, inhaled asbestos fibers can reach the pleura, causing swelling and inflammation. In turn, this can make blood vessels leak, which may result in pleural effusion. The effusion can be malignant (caused by cancer) or nonmalignant (caused by a noncancerous condition). In addition to asbestos-related causes, pleural effusion may arise from other conditions, including pneumonia, tuberculosis, pulmonary embolism, various cancers and congestive heart failure. Testing a fluid sample from the pleural space can help doctors determine why excess fluid is collecting. Treatment options will vary depending on the cause. Pleural effusion is a common symptom of mesothelioma and other asbestos-related diseases, especially as the diseases progress. In order to determine whether pleural effusion is present, doctors will order an imaging test, usually a simple chest X-ray. The fluid will show up on the X-ray once the accumulation has reached about 300 milliliters. Prior to that, it may be difficult to spot the fluid on a chest image. There are additional signs of this condition that aid doctors in diagnosing it. Doctors may notice diminished breath sounds or chest movement on the affected side of the chest and decreased vocal resonance. Some of these symptoms can also indicate pneumonia and other diseases or disorders, so doctors typically order more tests to make an accurate diagnosis. Once the doctor determines that there is indeed fluid in the pleural cavity, they may collect a sample for evaluation using a technique called thoracentesis. During the procedure, a doctor inserts a thin needle or plastic tube into the space where the fluid is collecting and draws out some or all of the fluid. The pleural fluid is then sent to a lab for testing. Analysis of the fluid can help doctors determine if cancer or another condition caused the effusion. Statistics show lung cancer, mesothelioma, breast cancer and lymphoma account for about 75 percent of all pleural effusions that contain cancer cells. 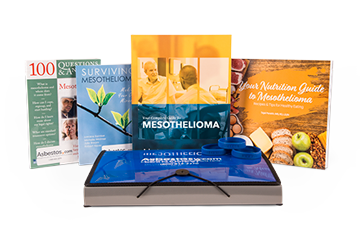 While the results of this test are not reliable enough to make a mesothelioma diagnosis, they can often reveal what caused the fluid buildup. If the cause possibly appears to be mesothelioma, doctors will perform a biopsy to confirm the results. Although pleural effusion causes painful and uncomfortable symptoms, there are several treatment options doctors use to manage the condition. Some aim to remove the fluid to alleviate symptoms (palliative), while others prevent future accumulations or treat the cause of the fluid buildup. Most patients with asbestos-related pleural effusions receive a thoracentesis, which removes fluid to make breathing easier and relieve pressure on the lungs. The procedure is basically the same as the diagnostic thoracentesis doctors use to help make a diagnosis, but as a palliative treatment it aims to completely drain the fluid rather than take a small sample for testing. Because thoracentesis does not address the cause of pleural effusion, the fluid continues to collect after the procedure. Most people need to have it repeated several times, as necessary, usually when symptoms return. Doctors may also place a thin tube called a catheter into the pleural space, leaving one end outside the body. The catheter is then connected to a device that drains and collects the excess fluid. Once you have this procedure, your fluid will drain regularly and you won’t have to keep returning to the doctor for a thoracentesis. In some cases, doctors may recommend pleurodesis, a long-term solution for recurring fluid buildup. During pleurodesis, doctors initiate the process to permanently close the pleural cavity to prevent the accumulation of fluid. After the fluid is removed by thoracentesis, doctors insert a chest tube to deliver drugs like talc or bleomycin that cause inflammation and close the pleural space. The procedure is not always effective and may have painful side effects. It should only be performed on people with good overall health and a prognosis with a life expectancy of at least several months. If pleurodesis is ineffective, a device called a shunt can be used to move the fluid from the pleural space to another part of the body. A pleuro-peritoneal shunt transfers excess chest fluid to the abdomen, where it is more likely to be absorbed by the body. For this procedure, the doctor inserts one end of a long, thin tube with a small pump in the middle into the pleural space, with the other end extending into the abdominal cavity. The pump is placed over the ribs, just under the skin. Once the shunt is in place, you can press on the pump to drain chest fluid into the abdomen. This can be repeated several times each day to help with symptoms. The American Cancer Society. (2016, February 17). Palliative Procedures for Mesothelioma. National Cancer Institute. (2013, March 25). Malignant Pleural Effusion. Myers, R. (2012, July). Asbestos-related Pleural Disease. Garrity, E. and Chandrasekhar, A.J. (n.d.). Pleural Effusion. Loyola University Medical Education Network. Agency for Toxic Substances and Disease Registry. (2010). Asbestos Toxicity: What Tests Can Assist with Diagnosis of Asbestos Toxicity? National Heart, Lung and Blood Institute. (2011, May 1). How Are Asbestos-Related Lung Diseases Treated?